AirBoat Rides at Midway offers not just a great ride, but a great experience on the legendary St. John's River. North Brevard Business Directory's extensive website offers details of over 80 destinations and activities in Brevard County, Florida. Ray Electric Outboards, offers the most reliable, quiet and efficient electric outboard in the world. Consider a Ray E-Boat for your boating pleasure. Sunward Tours - Space Coast's #1 Tour and Events Professionals. Titusville Area Chamber of Commerce official website for Scottsmoor, Mims, Titusville and Port St. John. 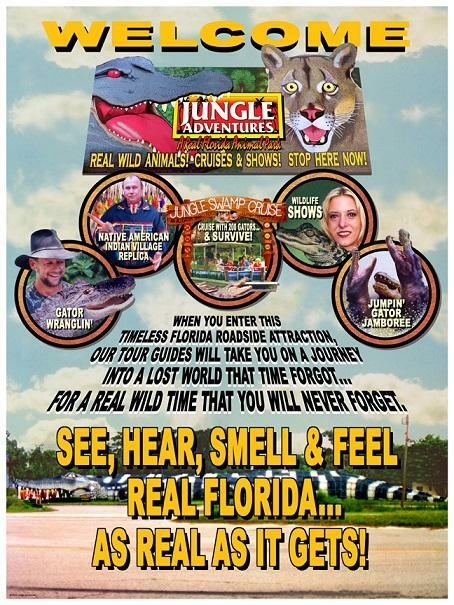 Jungle Adventures is proud to be a member of the Chamber. VisitFlorida.com is the Official Travel Planning Website for the State of Florida and Jungle Adventures is proud to be a member. VisitSpaceCoast.com is the Official Website for Florida's Space Coast.